Hi! I am having issues pairing my fob to a Sigma S32 alarm in my 2011 Outback: I have the pincode, but I cannot pair my existing key, a used key from a different Subaru, a chinese "copy" remote... Any ideas? I’m a electrician and I detest car electrics, they’re a dark and evil art. More electronic than electrical (bigger difference than you’d think) the stuff in cars. Always a million ****** cables everywhere you look in cars too. Good luck haha! 60 mm smoked face depo 4 in 1 gauge and single pod . It shows boost as analog and oil temp , oil pressure and volts as digital display . I've been using this on my own scoob for years and only removed it due to finally upgrading to defi's . It's in overall good condition and includes all sensors /wires needed to plumb it in . You will need a "Subaru specific temp sensor bung " to allow the temp sensor to fit in hole above cylinder no 3 . Only minor issue is that the insulation has deteriorated around the wires from the temp sensor. I just wrapped some insulation tape around it and it works fine (just being honest) £45 Posted to mainland UK, payment via PayPal pls . I'll try to find a pic of it lit up and post it on here later . Did you ever find out what this fuse was for? Hi The 50 amp Fuse is located in the engine compartment. It is within the engine bay fuse box. It should be a purple colour. Hope that helps. So my car failed the MOT last week on emissions. The car has been off the road for a couple of years and this was its first MOT since I’ve owned it. The MOT tester did try a few times, but the Lambda, HC and CO levels were apparently jumping about too much and he couldn’t get a stable test. The car is a Murtaya kit car fitted with a modified STI V3/V4 engine mapped with a Simtek ECU. I’ve since fitted a wideband gauge to check the AFRs. On initial start-up the AFR seems OK (between 14 and 14.8) but very quickly goes rich (circa 11.5 at idle). The same happens when I increase the revs to mimic the fast idle emissions test (AFR goes to ~14.5 then drops to ~12) So looks like the front Lambda needs to be replaced. The installed sensor is a 3 pin Bosch unit, but appears to have a non-standard triangular shaped plug. Since there doesn’t seem to be a OEM part with the correct plug available what would be the best replacement? Based on google research it appears that the Bosch units are not recommended, for these cars, so was planning to go for a universal Denso sensor and change the connector. Would this work or do I need to get the OEM part. Was also considering switching to a 4 wire sensor and running a new sensor ground. I’ve had grounding issues before on other cars when fitting lambdas and the four wire option seems to be a better option to me. I have also tested the coolant temp sensor, which seemed ok, but I will replace it anyway. 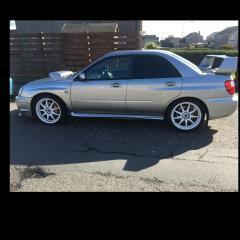 Evening, Im posting this on behalf of a friend who has no access to internet and needs some help regarding alloys/fitment, I have no real knowledge on Subaru specs, models or parts so any help would be much appreciated to us both! 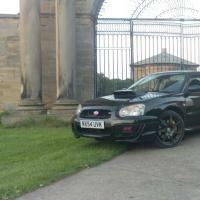 He currently owns a mint 2005 Subaru Impreza WRX Type UK on standard suspension/17inch alloys. He’s after a new set of alloys, preferentially 18inch Bola B1’s in gunmetal. After a trip to a couple of alloy centres on Saturday they are convinced he will not get these wheels to fit with the cars brembo brake set up? Neither company offered any solution or help regarding fitment which i found very poor. My first question is 5x114.3 or 5x110? I’m very unclear after a lot of digging online to find the right stud size. Secondly is the alloy fitment, surely 18inch Bola’s would clear the Brembo’s as the design of the B1’s look like they accommodate big brake set ups? My only other worry is the ET and arch work. Has anyone on here ran a similar set up and if so any help would be much appreciated. Thanks all. I'm about to start replacing the cambelt etc, but, how do I stop the engine rotating when I come to torquing up the crankshaft bolt? It's an automatic car. 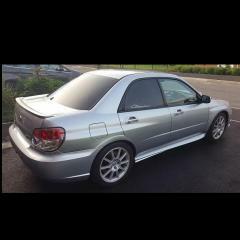 Hello, Welcome to the sale of my very rare 1 of 300 Subaru WRX GB270. Full Subaru Dealer/ Specialist History - 11 Stamps Collectors Car Build Number 215 First registered and pre delivery inspected by Ian Grieve Subaru of Falkirk on 23.01.2008 this example has had 4 enthusiast keepers. Notably, the MOT history is exemplary having never had an advisory placed against it, testament to the manner in which its been maintained throughout the years. 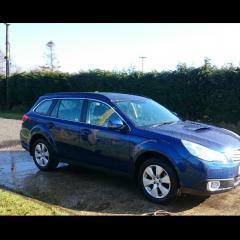 Service History 12.03.07 Subaru Monk Heath Motors 956 miles 03.04.04 Subaru Ian Grieve Falkirk 10632 miles 28.08.09 Subaru Ian Grieve Falkirk 20560 miles 11.03.10 Subaru Eaglesham Garage 30839 miles 15.09.10 Subaru Ian Grieve Falkirk 40492 miles 23.08.11 Subaru Ian Grieve Falkirk 56180 miles 25.06.12 Subaru Eaglesham Garage 60306 miles 30.05.13 Subaru Eaglesham Garage 70739 miles 10.06.14 Auto Service Specialist 77849 miles 12.08.16 Auto Service Specialist 88288 miles 11.10.18 TVS 92434 miles The GB 270 A limited edition final model iconic Impreza 2.5 WRX saloon. The GB270, is limited to only 400 units (300 for the Impreza GB270 saloon and 100 for the Sports Wagon and offered around £7,600 in extra equipment. Benefiting from the 270 hp Prodrive Performance Pack which boosts power by 40 hp and torque by 74 lb ft to 310 lb ft, as a result the mid-range response is substantially improved. Other shared features include a lowered spring kit, ‘quickshift’ gear change, special carpet mats, MOMO ‘Air-Race’ gear knob, larger-diameter 18x7.5ins GT1 alloy wheels and GB270 exterior badging and individually numbered interior plaque. Specific to the GB270 saloon are a WRC-style rear spoiler, stainless-steel mesh front grille, STI front lip spoiler and silver-finished alloy wheels. This car features the extra-cost upgraded GB270-branded Alcantara/leather interior which was a £1,600 option. The car is an absolute blast to drive, the in house custom remap, increases power and boosts torque across a wider rev range than the standard engine improving on the standard bhp considerably. These improved characteristics ensure that driver has the responsiveness required for performance driving including all-important, mid-range overtaking. A revised engine management system, and a stainless steel sports exhaust system, plus a dump valve, the car is really all about mid range power. The Drive An extremely well thought out highly developed piece of kit that will out accelerate many modern day fast cars and cover cross country miles with a stability and turn of speed that has to be witnessed to be truly believed, these cars are supreme in this area. All this achieved with extremely comfortable suspension and plenty creature comforts. Few cars offer such versatility, practicality, reliability and sheer fun. The reserves of power and the outright ability of the handling will never be exploited fully by any normal driver on a public road. There are few models available in the current market at any time. Standard Specification PPP Prodrive pack World Rally Performance Blue Aluminium Interior Trim Air Conditioning 4x Electric Windows Electric Mirrors Remote Central Locking P.A.S. ABS CD Player Sigma Alarm with two keys and two fobs Multiple Air Bags Tinted Glass Brembo Brakes 17 " Prodrive Alloys Subaru Anti Theft System Stainless Steel Exhaust Fitted branded carpet mats Other Information Mot 24th August 2019 Full owners pack with handbook Two remote keys Fully HPI clear Spare wheel and tools *Please note this is a 12 year old car. 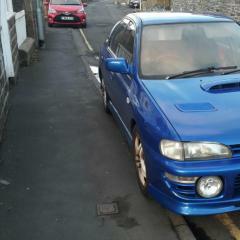 I have had the bonnet resprayed, the lower front lip and the arches to get rid of stone chips and surface corrosion. There is light corrosion on rear arch where it meets bumper and rear drivers door handle. 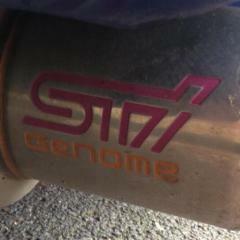 These are not bad enough to need a respray but I am over critical! The only other minor issue is cracking of the fog light lenses. I also had the alloys refurbished so they are spotless. This is an appreciating classic, slightly lower mileage cars from used dealers are selling for north of £10,000; this is a very well priced car; especially with the costly alcantara interior. If you have any questions or picture requests please just ask. Thanks, Chris. *Offer accepted on my house so just dropped price considerably to £6,500 from £7,750. That is really cheap for these limited edition cars.